Students are strongly encouraged to take Physical Education courses throughout their four years of high school. All students are required to pass 15 credit hours of Wellness/P.E. 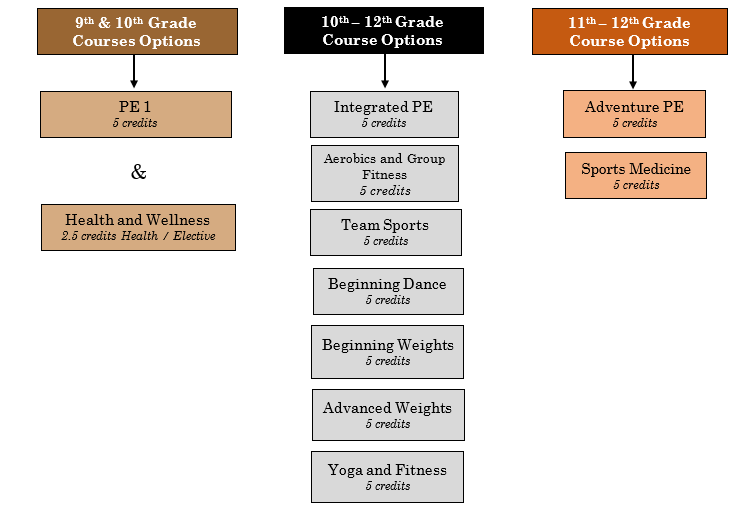 Physical Education 1 is a prerequisite for ALL other PE classes. Not all options will be offered each semester. This class should be taken during the freshman or sophomore year and is a prerequisite for all other physical education classes. Course could be taken concurrently with Health or Athletic Weights Conditioning with teacher approval. This class will address a variety of individual activities, team sports and personal fitness. This class will include instructions about the use of the school's fitness center, team building activities, sports etiquette and behavior expected in the physical education class setting. This course is designed to meet the Colorado Academic Standards for Physical Education. This course fulfills Wellness credit. Wellness is defined as the quality or state of being in good health especially as an actively sought goal. This class teaches student how to pursue an active lifestyle along with making positive health choices. Topics of study include those aspects of wellness reflected in the Colorado Academic Standards for Physical Activity and Comprehensive Health including physical activity; healthy eating; sexual health; health promotion; emotional and social wellness; alcohol, tobacco, and drug prevention; violence-free relationships; and safety. This course fulfills 2.5 credits of Health and 2.5 credits of Wellness. This course is designed to improve muscular strength and endurance. It is designed to be a basic weight-training course, not a bodybuilding course. The students will be introduced to a variety of weight training techniques, methods, and principles. Students will learn the terminology, anatomy and physiology necessary to understand the basic principles behind weight training. Emphasis will be on proper lifting technique, spotting technique, and safety throughout the course. Students will learn to use the available machines, as well as free weights. This course is open only to juniors and seniors who have successfully completed a beginning weight training course at this high school. Students will review the techniques, methods and principles presented in the beginning course. Additional training methods will be introduced and practiced. This course will develop and extend the artistic, affective cognitive and psychomotor potential of all levels of dancers. The student will be provided with opportunities to explore, choreograph, organize, evaluate, and perform a variety of dance forms. This course is designed to introduce physical fitness as a part of a total healthy lifestyle. The main emphasis is on cardiovascular fitness, but muscular strength, muscular endurance, coordination and flexibility will also be developed and improved. Step aerobics, low impact aerobics, and other aerobic activities will be included in the class. The students will be introduced to the basic skills, strategies and formations needed to play a variety of team sports. Skills will be developed through drill and game situations. Rules, terminology and safety precautions will be presented. Cooperation and the elements of effective teamwork will be stressed in all situations. Yoga will be the emphasis in this course. This course will offer students a chance to explore the connection between mind and body and to use this understanding as a basis for a lifelong commitment to wellness. The course is designed to give students an introduction to Yoga as a means of physical and emotional wellness. This course will also include a variety of cardiovascular, strength and flexibility exercises to address all of the health-related fitness components. In addition, Mindfulness practices will also be taught. This course provides an opportunity for the study and application of the components of sports medicine including but not limited to: sports medicine related careers, organizational and administrative considerations, prevention of athletic injuries, recognition, evaluation, and immediate care of athletic injuries, rehabilitation and management skills, taping and wrapping techniques, first aid/CPR/AED, emergency procedures, nutrition, sports psychology, human anatomy and physiology, therapeutic modalities, and therapeutic exercises. This class will address intermediate or highly skilled individuals who wish to continue with traditional activities in an advanced level, as well as being exposed to new and non-traditional sports. Past examples of classes include wall climbing, mountain bike, polo, archery, scuba diving, geo caching, and orienteering. At FRHS: This class is for juniors and seniors only. Students must provide or have access to transportation (a driver’s license is recommended). Fees will be charged to cover field trip expenses and students will be expected to provide their own bike and helmet. Because this course is not offered to meet a graduation requirement, fees cannot be waived. Teacher signature is required for this class.